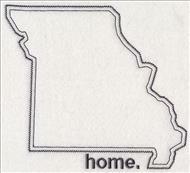 There's no place like home! 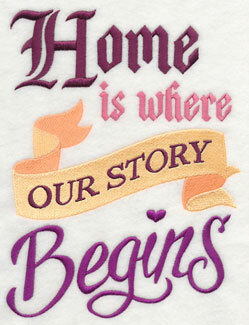 Transform any house into a home with personalized embroidery projects featuring this week's new designs. 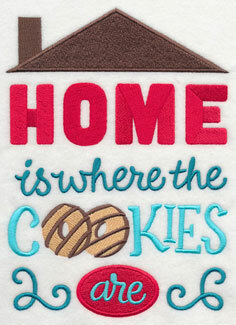 Start off by adding a sweet saying or sampler to home decor projects, such as pillows or quilts. 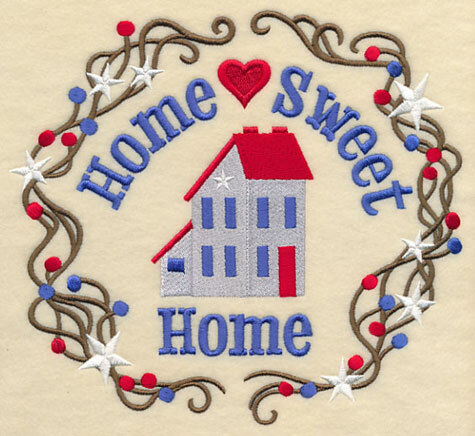 The word "Home" in multiple variations shines on wall hangings or welcome flags; country-style stars and a new wreath will add a classic look to any project. 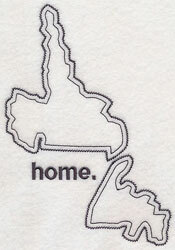 Plus, new US state and Canadian province and territory outlines are a fabulous way to show your pride for your homeland. 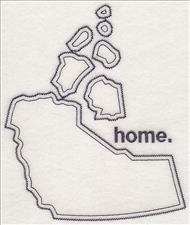 Stitch on framed artwork, tote bags, kitchen gear, and more. 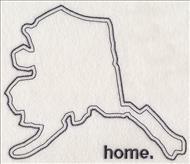 Stitch your home state or Canadian province or territory and frame as patriotic wall art. Click here to see how! 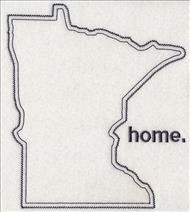 You know what they say: "Home is where the heart is." 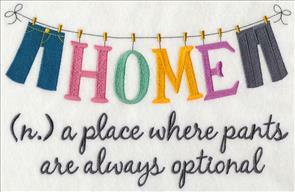 Whip up fabulous projects for your home with these meaningful sayings and samplers. 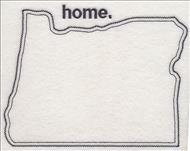 Perfect for accentuating a pillow, framed art, or a quilt. 7.39" x 6.91" and 6.27" x 5.86"
6.89" x 9.11" and 5.86" x 7.75"
4.86" x 6.41" and 2.93" x 3.86"
If your favorite food is cookies or pizza, boy, have we got the goods for you! 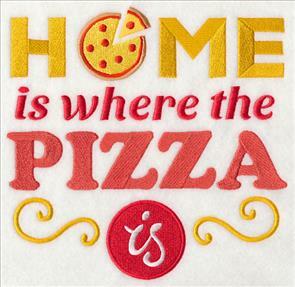 Showcase your love for the tasty treats on dish towels, aprons, and more with these fun quotes. 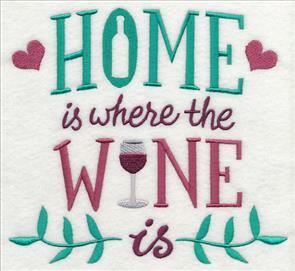 6.90" x 9.56" and 5.64" x 7.81"
5.97" x 5.86" and 4.95" x 4.86"
Wine lovers will adore embroidering this design on items for their kitchen, bar area, or dining room. 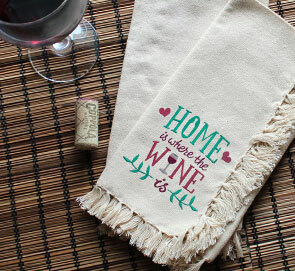 Add this vino-inspired motif to placemats, wine bags, and kitchen towels. 7.57" x 6.85" and 6.46" x 5.85"
5.36" x 4.85" and 3.86" x 3.49"
There's no better way to celebrate summer than with a nice, cold brew or a trip around the lake. 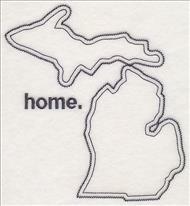 Great for framed art, wall hangings, T-shirts, and more! 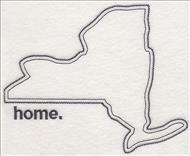 6.86" x 9.08" and 5.86" x 7.75"
6.62" x 7.81" and 5.86" x 6.91"
4.86" x 5.73" and 3.28" x 3.87"
Stitch a little humor on your next embroidery project. 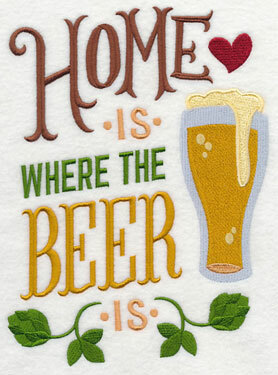 These funny sayings are sure to make guests and family members chuckle when stitched on pillows, framed art, and more. 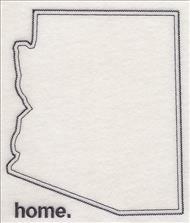 6.80" x 7.81" and 5.86" x 6.72"
10.70" x 6.91" and 9.06" x 5.85"
7.79" x 5.03" and 6.86" x 4.43"
Your furry feline (or felines!) will get their turn in the spotlight with these fun samplers. 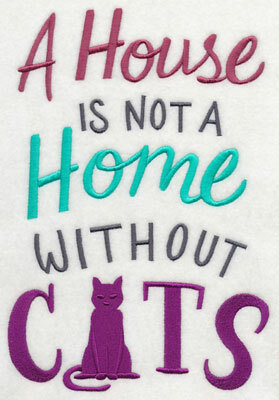 Add the "A House is Not a Home" quotes to wall hangings, pillows, pet beds, and more. 6.86" x 9.67" and 5.54" x 7.81"
6.91" x 9.98" and 5.41" x 7.81"
4.75" x 6.86" and 2.68" x 3.86"
Turn this (or any!) 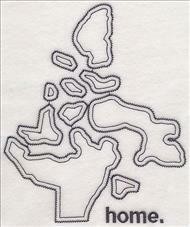 design into a one-color wonder by stitching all the color stops with the color of your choice. 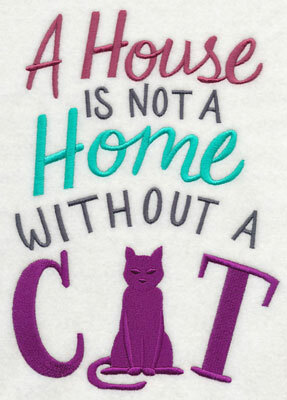 Here, we stitched out the "A House is Not a Home Without a Cat" design on a teal pillow with white thread to fit the color scheme. 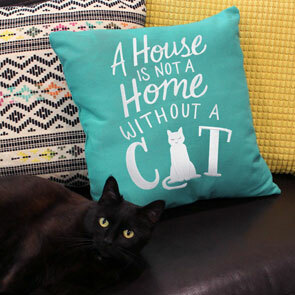 Blair the cat gives this pillow "two paws up!" 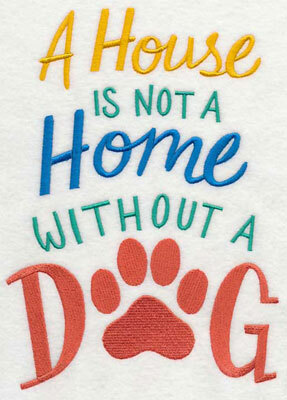 If your favorite four-legged animal barks instead of meows, the dog variations of the designs above are just for you. 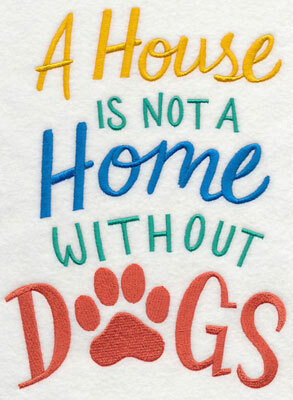 A paw print takes the place of the "o" in "dog". 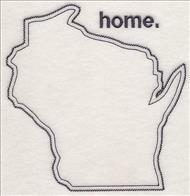 Terrific on dish towels, tote bags, pillows, and more. 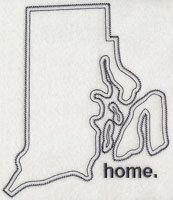 6.90" x 9.64" and 5.59" x 7.81"
6.91" x 9.30" and 5.80" x 7.81"
4.86" x 6.55" and 2.86" x 3.86"
The word "Home" evokes memories of family, friends, and good times for all. 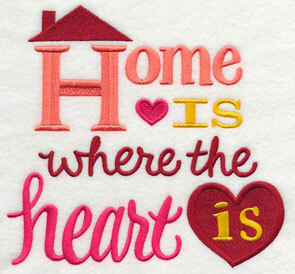 Stitch this meaningful word with the "o" replaced with a fun accent, like the house shown here. 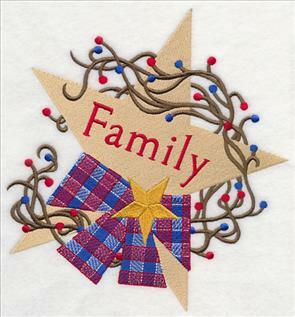 Each variation comes in two styles: stitch-filled and multi-piece heirloom applique. Get our top tricks for embroidering multi-piece heirloom applique designs in this project tutorial, or in this video. 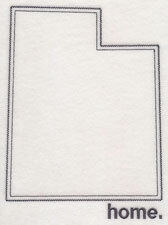 11.01" x 3.34" and 9.41" x 2.86"
11.00" x 3.39" and 9.40" x 2.90"
7.82" x 2.41" and 6.85" x 2.12"
These charming designs are perfect for stitching onto pillows, wall hangings, flags, in frames, and more. Pick the design and accent that matches your home decor, or change them out seasonally. 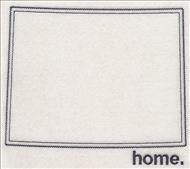 11.01" x 3.23" and 9.41" x 2.77"
11.00" x 3.25" and 9.41" x 2.76"
7.81" x 2.30" and 6.86" x 2.02"
A bolster pillow is an especially great way to showcase these designs, as the shape of the pillow matches the shape of the word "Home." See all of our pillow projects in this exciting Lookbook, or in the Pillow Party videos. 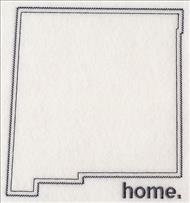 They're a great way to jump-start your creativity and get started on your home decor projects. 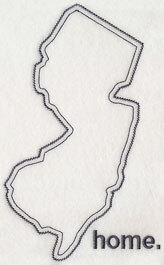 Choose the stitch-filled versions of these designs to add a classic look to your embroidery. 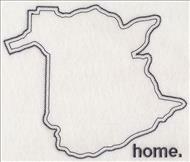 Or, use your favorite fabrics with the applique versions. 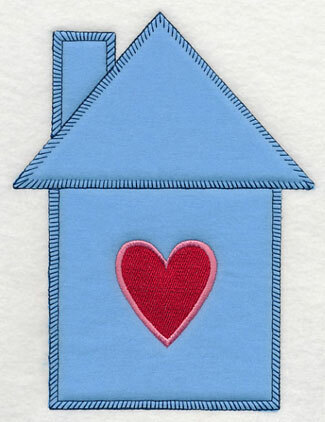 For even more information on multi-piece heirloom applique, visit this helpful (and free!) tutorial. 11.00" x 3.15" and 9.38" x 2.69"
11.00" x 3.13" and 9.40" x 2.68"
7.79" x 2.23" and 6.86" x 1.96"
A pretty butterfly brings the feel of spring and summer weather to any project with this design. Change the colors of the thread and fabrics to match the color scheme in your home. 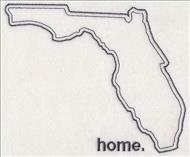 11.00" x 2.78" and 9.39" x 2.38"
10.99" x 2.89" and 9.39" x 2.47"
7.80" x 2.05" and 6.85" x 1.80"
Bring a smile to friends and family with this adorable bird. 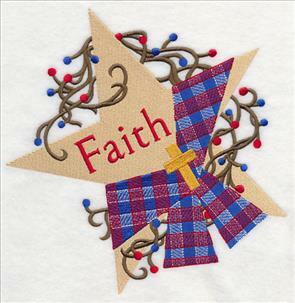 Find helpful hints on embroidering multi-piece heirloom applique designs in this written tutorial, or in this video. 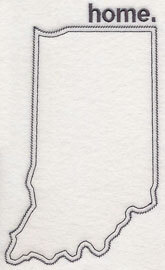 11.00" x 3.23" and 9.40" x 2.76"
10.98" x 3.38" and 9.37" x 2.89"
7.80" x 2.40" and 6.88" x 2.10"
A hint of nautical style is added to the "Home" design with an anchor accent. 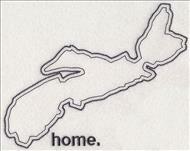 Great for boating gear, outdoor decor, or any beach-theme decorating scheme. 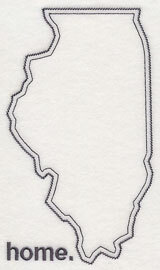 11.01" x 3.27" and 9.41" x 2.80"
11.00" x 3.45" and 9.40" x 2.95"
7.80" x 2.45" and 6.85" x 2.15"
Stitch this star variation in red and blue for a July 4th-inspired look, or change up the colors for various seasons, decorating schemes, and more! Red and green are a classic Christmas combo, or try white and navy for a nautical approach. 11.01" x 3.51" and 9.41" x 3.00"
11.00" x 3.60" and 9.40" x 3.08"
7.80" x 2.56" and 7.80" x 2.56"
Add a tasty look to kitchen projects with this cupcake design. 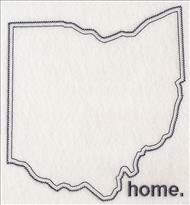 The sweet treat will shine on dish towels, aprons, placemats, and more. Get our top tricks for embroidering multi-piece heirloom applique designs in this project tutorial, or in this video. 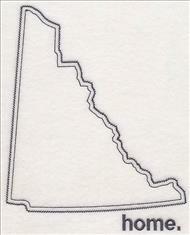 10.99" x 3.28" and 9.39" x 2.80"
11.00" x 3.41" and 9.38" x 2.91"
7.80" x 2.42" and 6.86" x 2.13"
These designs are also a great way to embroider for the holidays, like with the shamrock version below. 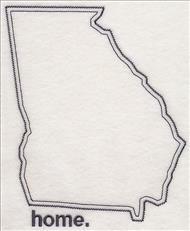 Stitch it for St. Patrick's Day, then switch out for a different variation after the holiday is over. 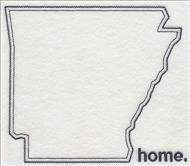 11.01" x 2.97" and 9.41" x 2.54"
11.00" x 3.26" and 9.40" x 2.78"
7.80" x 2.31" and 6.85" x 2.03"
These homey designs are excellent additions to pillows, wall hangings, welcome flags, and so much more. Pick your favorites by using the links above, or get all the designs in a design pack. 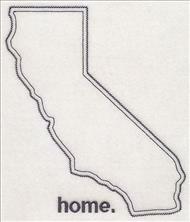 Two versions are shown below: stitch-filled, and heirloom applique. 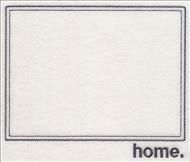 Modeled after classic saltbox architecture, this "Home Sweet Home" wreath is a cozy addition to any living room decor. 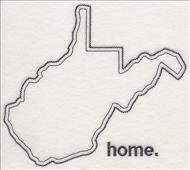 Stitch it on a pillow or wall hanging -- or, get creative and add the country-style design to a garden flag or welcome mat. 7.60" x 6.90" and 6.45" x 5.86" and 5.36" x 4.87" and 3.86" x 3.51"
Charming country stars are surrounded by berries and brambles, and adorned with gingham ribbon. 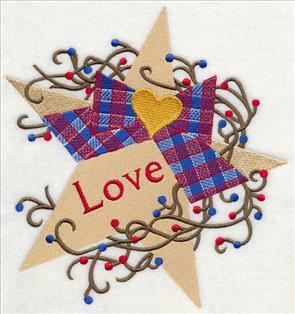 Each of the delightful designs feature an important value: "Family" with a star on the left, "Love" and a heart on the right. 7.44" x 7.79" and 6.90" x 7.23"
7.45" x 7.80" and 6.89" x 7.21"
Finish off the trio of country stars with "Faith," adorned with a gold cross. 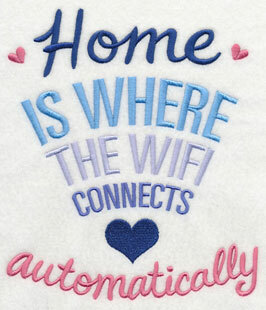 Stitch all three on a bolster pillow, wall hanging, or series of framed artwork. 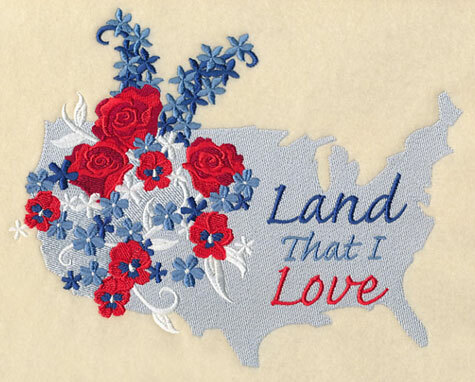 7.79" x 7.73" and 6.90" x 6.84" and 5.86" x 5.80" and 4.85" x 4.81"
Beautiful blooms of red, white, and blue turn this United States outline into a breathtaking affair. 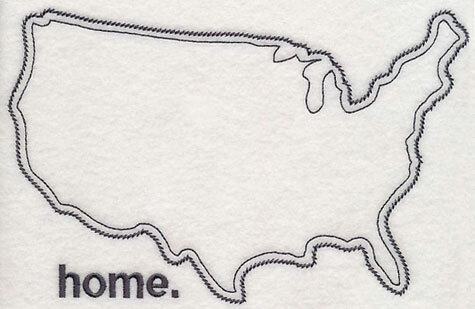 The words "Land That I Love" spell out American spirit. 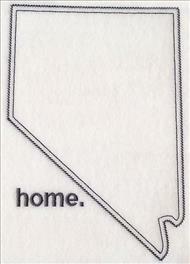 Great on pillows, totes, and more home decor. 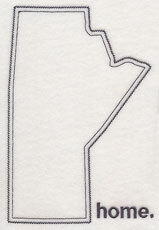 8.59" x 6.89" and 7.80" x 6.26" and 7.17" x 5.76" and 6.04" x 4.85"
Stitch your patriotic pride on framed artwork, wall hangings, quilts, and more with new United States outlines. 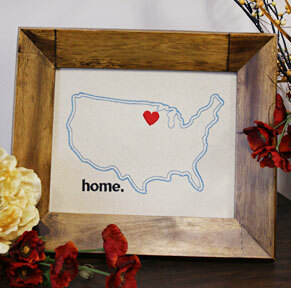 Find your home state and add to an embroidery project, or stitch them all to show your love for the USA. 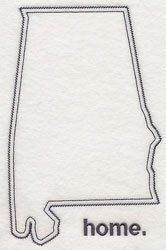 These states have been created in the vintage style, and are best embroidered on smooth, low-nap fabrics like quilter's cotton, linen, denim, and more. 8.36" x 5.33" and 7.74" x 4.94" and 7.17" x 4.58" and 5.90" x 3.77" and 3.86" x 2.47"
5.37" x 8.34" and 4.98" x 7.73"
4.62" x 7.16" and 3.80" x 5.89"
8.09" x 6.89" and 7.51" x 6.40"
6.93" x 5.90" and 5.72" x 4.88"
6.90" x 8.05" and 6.41" x 7.48"
5.90" x 6.87" and 4.89" x 5.69"
8.04" x 6.87" and 7.44" x 6.36"
6.90" x 5.90" and 5.66" x 4.85"
6.86" x 7.94" and 6.36" x 7.35"
5.89" x 6.81" and 4.85" x 5.60"
7.61" x 6.34" and 7.06" x 5.88"
6.54" x 5.45" and 5.38" x 4.47"
8.46" x 6.12" and 7.83" x 5.67"
7.26" x 5.26" and 5.97" x 4.32"
3.86" x 8.35" and 3.58" x 7.74"
3.32" x 7.17" and 2.74" x 5.89"
8.36" x 6.80" and 7.74" x 6.30"
7.18" x 5.84" and 5.90" x 4.80"
6.81" x 8.19" and 6.31" x 7.59"
5.84" x 7.03" and 4.81" x 5.77"
8.41" x 5.32" and 7.80" x 4.93"
7.22" x 4.57" and 5.94" x 3.76"
5.27" x 8.34" and 4.89" x 7.72"
4.53" x 7.16" and 3.73" x 5.88"
4.84" x 8.37" and 4.49" x 7.76"
4.16" x 7.19" and 3.43" x 5.91"
5.04" x 8.44" and 4.67" x 7.82"
4.33" x 7.24" and 3.57" x 5.95"
8.35" x 5.93" and 7.74" x 5.49"
7.17" x 5.09" and 5.89" x 4.18"
8.29" x 5.29" and 7.68" x 4.90"
7.11" x 4.54" and 5.85" x 3.73"
8.22" x 4.52" and 7.62" x 4.18"
7.06" x 3.88" and 5.80" x 3.19"
7.18" x 6.87" and 6.66" x 6.36"
6.17" x 5.89" and 5.07" x 4.85"
5.64" x 8.22" and 5.23" x 7.62"
4.85" x 7.06" and 3.99" x 5.80"
8.03" x 4.39" and 7.44" x 4.07"
6.90" x 3.77" and 5.67" x 3.11"
8.30" x 5.12" and 7.69" x 4.74"
7.13" x 4.40" and 5.86" x 3.62"
6.85" x 7.40" and 6.35" x 6.86"
5.89" x 6.36" and 3.59" x 3.87"
6.83" x 7.84" and 6.33" x 7.26"
5.86" x 6.73" and 4.82" x 5.53"
5.15" x 8.21" and 4.77" x 7.61"
4.42" x 7.05" and 3.64" x 5.80"
7.20" x 6.47" and 6.67" x 6.00"
6.18" x 5.56" and 5.08" x 4.57"
7.47" x 4.69" and 6.92" x 4.34"
6.41" x 4.02" and 5.27" x 3.31"
7.99" x 4.55" and 7.40" x 4.22"
6.86" x 3.91" and 5.64" x 3.21"
5.70" x 8.17" and 5.29" x 7.58"
4.90" x 7.01" and 4.04" x 5.77"
4.28" x 7.85" and 3.97" x 7.28"
3.68" x 6.74" and 3.03" x 5.55"
5.06" x 8.35" and 4.69" x 7.74"
4.35" x 7.17" and 3.57" x 5.89"
6.58" x 7.08" and 6.10" x 6.56"
5.65" x 6.08" and 4.65" x 4.99"
8.20" x 6.55" and 7.60" x 6.07"
7.05" x 5.63" and 5.79" x 4.63"
8.35" x 3.40" and 7.73" x 3.15"
7.17" x 2.92" and 5.89" x 2.41"
7.90" x 5.52" and 7.32" x 5.12"
6.79" x 4.74" and 5.58" x 3.90"
6.87" x 7.56" and 6.45" x 7.10"
5.87" x 6.46" and 4.87" x 5.36"
8.39" x 4.10" and 7.78" x 3.80"
7.21" x 3.53" and 5.92" x 2.90"
8.06" x 6.18" and 7.47" x 5.72"
6.93" x 5.30" and 5.69" x 4.35"
8.01" x 4.99" and 7.42" x 4.62"
6.88" x 4.28" and 5.65" x 3.52"
6.84" x 7.97" and 6.34" x 7.38"
5.87" x 6.84" and 4.83" x 5.62"
8.19" x 6.25" and 7.59" x 5.79"
7.03" x 5.37" and 5.78" x 4.41"
7.93" x 5.08" and 7.35" x 4.71"
6.81" x 4.36" and 5.60" x 3.59"
8.38" x 2.28" and 7.76" x 2.12"
7.19" x 1.96" and 5.89" x 1.63"
7.19" x 6.89" and 6.69" x 6.40"
6.14" x 5.88" and 5.09" x 4.88"
6.26" x 8.43" and 5.80" x 7.81"
5.38" x 7.24" and 4.42" x 5.94"
5.19" x 8.30" and 4.81" x 7.69"
4.46" x 7.12" and 3.66" x 5.85"
8.23" x 4.45" and 7.62" x 4.12"
7.06" x 3.82" and 5.80" x 3.14"
8.16" x 5.79" and 7.56" x 5.37"
7.01" x 4.97" and 5.76" x 4.09"
7.73" x 6.83" and 7.17" x 6.33"
6.64" x 5.87" and 5.46" x 4.83"
6.72" x 6.98" and 6.23" x 6.47"
5.77" x 5.99" and 4.75" x 4.93"
7.74" x 6.69" and 7.18" x 6.20"
6.65" x 5.74" and 5.47" x 4.72"
Point out your home town or favorite city to visit on one of the state outlines above with these mini-markers. 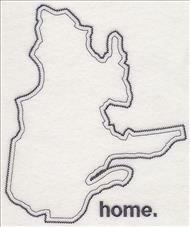 A house, heart, star, drop pin, and "X" all mark the spot. 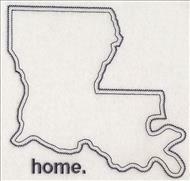 Pick your home state from the outlines above using the individual links. 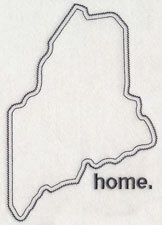 Or, get all fifty states, the US outline, and all five mini-markers together in a design pack. 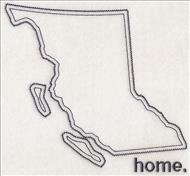 The thirteen Canadian provinces and territories are all also available in this classic outline style, and are a terrific way to stitch your homeland. 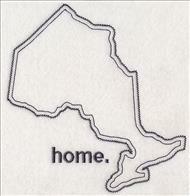 Embroider onto dish towels, aprons, bed linens, and more for a hint of Canadian pride. 7.43" x 6.85" and 6.88" x 6.34"
6.38" x 5.87" and 5.24" x 4.82"
4.84" x 8.30" and 4.49" x 7.70"
4.16" x 7.13" and 3.42" x 5.86"
4.03" x 8.45" and 3.74" x 7.82"
3.48" x 7.28" and 2.87" x 5.98"
5.58" x 8.27" and 5.17" x 7.66"
4.79" x 7.10" and 3.94" x 5.84"
6.87" x 7.25" and 6.37" x 6.72"
5.90" x 6.22" and 4.85" x 5.12"
6.86" x 8.24" and 6.36" x 7.63"
5.89" x 7.08" and 4.85" x 5.82"
8.15" x 6.85" and 7.56" x 6.35"
7.00" x 5.88" and 5.75" x 4.84"
8.29" x 6.61" and 7.68" x 6.12"
7.12" x 5.67" and 5.85" x 4.66"
8.26" x 5.57" and 7.65" x 5.16"
7.09" x 4.78" and 5.83" x 3.93"
5.67" x 8.18" and 5.26" x 7.58"
4.87" x 7.02" and 4.01" x 5.77"
6.70" x 8.33" and 6.21" x 7.71"
5.76" x 7.15" and 4.73" x 5.87"
6.84" x 8.12" and 6.34" x 7.53"
5.87" x 6.98" and 4.82" x 5.73"
6.87" x 8.20" and 6.37" x 7.60" and 5.90" x 7.04" and 4.85" x 5.78" and 3.24" x 3.86"
A selection of mini-markers, including a house, heart, star, drop pin, and "X", will show off your hometown or favorite city when stitched with the province and territory outlines above. 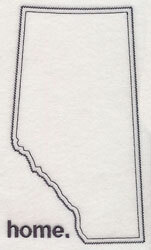 Not only can you purchase the Canadian provinces and territories individually using the links above, but you can also get all thirteen (plus all five mini-markers) together in a design pack. 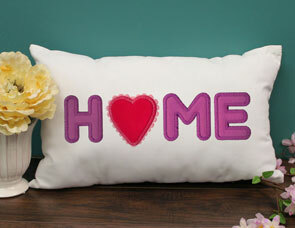 Use your favorite fabric to give this house a personal touch on pillows, blankets, and quilts. 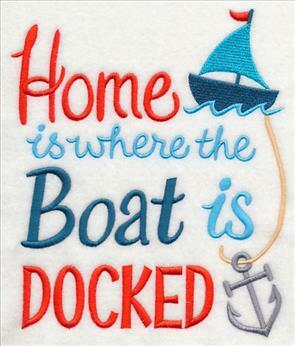 This design has been stitched in the classic heirloom applique style, which uses an E-stitch, or blanket stitch, to add extra-cozy appeal. 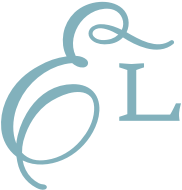 Find out more about heirloom applique designs right here. 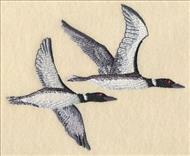 5.85" x 7.67" and 4.85" x 6.36" and 2.94" x 3.86"
Carol requested a collage of loons, and separations for each of the featured birds. What a fabulous suggestion, Carol! 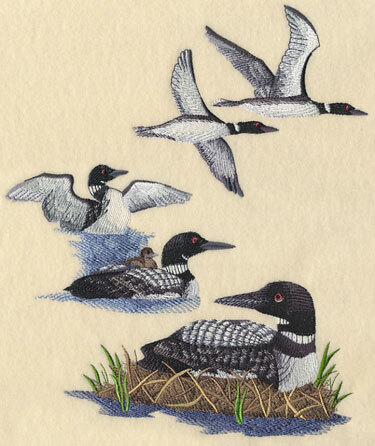 Loons are the Minnesota state bird, so we hold a special place in our heart for them. 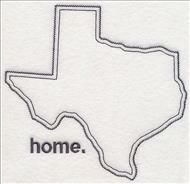 Stitch the collage and coordinating individual designs on quilts, wall hangings, pillows, and more. 8.59" x 10.37" and 6.45" x 7.80" and 5.85" x 7.07" and 4.85" x 5.87"
5.55" x 3.47" and 3.15" x 1.97"